In a thrilling blow-by-blow battle, unbeaten, hard-hitting Chinese 126-pounder Yiran Li (R) marked the most telling victory in his young career as he scored a round 7 Technical Decision win over tough Filipino southpaw Joe Tejones (10-6-6 KO's) to claim the vacant WBC Youth World Featherweight Title at Olympic Park in Xi' An, northern China. The Chinese Yiran Li (5-0, 4 KO's) was leading in points throughout the war, though the dangerous Tejones came-in strong in rounds 6 and 7 landing effective combinations to the head and body of Li that got the Chinese groggy and in trouble. However a cut on the Chinese surface too severe during the rough action of the seventh chapter for the match to go on. Due to that, referee Michiaki Someya of Japan halted the action at the 2:16 minute mark in round seven, sparing Li of further damage to his eye. Great action fight. The supervisor for the WBC was Tsuyoshi Yasukochi of the Japan Boxing Commission (JBC). The Chinese boxer Yiran Li is trained by Filipino coach Jericho Asilo of the MP-Highland Boxing Gym. Chinese boxer ZongLi He (C) with his manager and his Filipino trainer Roldan Bullong of Benguet (L). 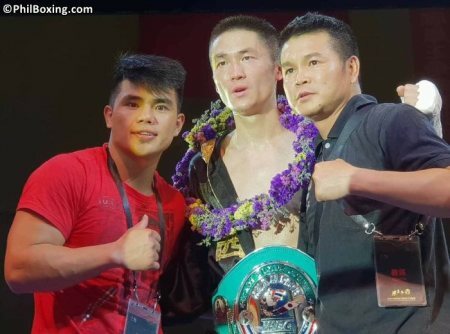 In the co-main event, undefeated 115-pounder ZongLi He (4-0, 1 KO) of Chengdu, China, captured the vacant WBC Asia Boxing Council Silver Super Flyweight belt via a 10-round unanimous decision over Filipino lefty Diarh "Die Hard" Gabutan (20-7-3, 11 KO's) of the Highland Boxing Stable. 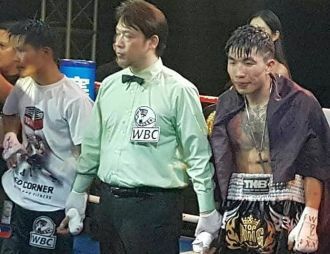 ZongLi He, 23, visited the canvas two times during the exciting battle, though no count was administered by experienced Thai referee Thawuth Pluemsamran. Bullong of Benguet, one of the trainers of the MP-Highland Boxing. For this tough fight, the Filipino Gabutan, 29, might have felt a bit strained battling as super flyweight as he normally fights in upper weight classes. During the official weigh-in Gabutan made 114¾, the lowest weight he has made in the last ten years. "No excuse. The Chinese was better. But for next fights Gabutan should perform much better as bantam or super bantam," shared Brico Santig, Gabutan's manager. In another international clash, mean-puncher Indonesian featherweight Ari Agustian (6-0, 6 KO's) came rushing-in as a bull to ravage confused 20-year-old Chinese Baolin Kang in the very first instance of the fight to win fast the vacant WBC Asian Boxing Council Youth 126 lbs crown. It was at the mark of 2:23 minutes in round 1 that referee Thanin Phoompiew of Thailand waived fight off. It was the first time that the 22 year-old Indonesian Agustian fights outside of his native land, and he performed remarkably well, motivating him to press full steam ahead in his passion sport, boxing. In women's boxing, hometown 20 year-old warrior girl Li Ping Shi (3-2, 2 KO's) overpowered in the 8th rounds cute Korean fight lady Hyun Hee Kil I(4-2, 1 KO) in front of her excited fans to become the new WBC Asian Boxing Council Female 115 lbs Champion. Referee Thawuth Pluemsamran of the Kingdom of Thailand declared the RTD at the 32 seconds mark in round eight. The boxing event in Xi'an, China was a production of promoter Fei Wang of Xian Topking Promotion as pro boxing becomes more and more popular in the People's Republic of China.